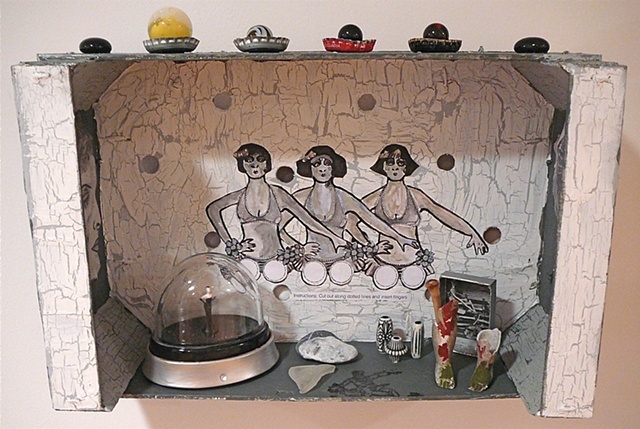 mixed media: in wood fruit box: acrylic paint, found objects, bottle caps, marbles, glass globules, tumbled glass, beads, collaged matchbox, perfume dispenser, stones, doll's legs. there is an element of tribal fetish in your works... I like that. it is / they are/ beautiful! Awesome work, Jennifer! I like just the touch of colour ...says so much! I love it! The white, the female figures, the crackles, the bottle caps!!!! I love your brilliant style, Jennifer!!! Great impulse to our imagination by your choice of the things, colors , the signs of wear. And always : the big expression !! one of my faves !!! Jennifer, a collection of so much material to put this creative piece together. A work of love and so beautifully done! Fabulous textures, colours and 3d effect! Such wonderful artwork and very nicely presented too!